Anoxic waters are areas of sea water, fresh water, or groundwater that are depleted of dissolved oxygen and are a more severe condition of hypoxia. The US Geological Survey defines anoxic groundwater as those with dissolved oxygen concentration of less than 0.5 milligrams per litre. This condition is generally found in areas that have restricted water exchange. In most cases, oxygen is prevented from reaching the deeper levels by a physical barrier  as well as by a pronounced density stratification, in which, for instance, heavier hypersaline waters rest at the bottom of a basin. Anoxic conditions will occur if the rate of oxidation of organic matter by bacteria is greater than the supply of dissolved oxygen. 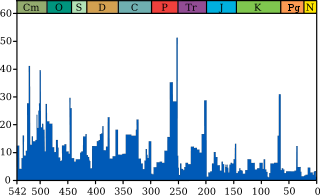 The Permian–Triassicextinction event, colloquially known as the Great Dying, the End-Permian Extinction or the Great Permian Extinction, occurred about 252 Ma ago, forming the boundary between the Permian and Triassic geologic periods, as well as between the Paleozoic and Mesozoic eras. It is the Earth's most severe known extinction event, with up to 96% of all marine species and 70% of terrestrial vertebrate species becoming extinct. It is the only known mass extinction of insects. Some 57% of all biological families and 83% of all genera became extinct. Because so much biodiversity was lost, the recovery of land-dwelling life took significantly longer than after any other extinction event, possibly up to 10 million years. Studies in Bear Lake County, near Paris, Idaho, showed a relatively quick rebound in a localized marine ecosystem, taking around 2 million years to recover, suggesting that the impact of the extinction may have been felt less severely in some areas than others. Anoxic conditions result from several factors; for example, stagnation conditions, density stratification,  inputs of organic material, and strong thermoclines. Examples of which are fjords (where shallow sills at their entrance prevent circulation) and deep ocean western boundaries where circulation is especially low while production at upper levels is exceptionally high. [ citation needed ] In wastewater treatment, the absence of oxygen alone is indicated anoxic while the term anaerobic is used to indicate the absence of any common electron acceptor such as nitrate, sulfate or oxygen. Anoxia is quite common in muddy ocean bottoms where there are both high amounts of organic matter and the low levels inflow of oxygenated water through the sediment. Below a few centimeters from the surface the interstitial water (water between sediment) is oxygen free. The temperature of a body of water directly affects the amount of dissolved oxygen it can hold. Following Henry's law, as water becomes warmer, oxygen becomes less soluble in it. This property leads to daily anoxic cycles on small geographic scales and seasonal cycles of anoxia on the larger scale. Thus, bodies of water are more vulnerable to anoxic conditions during warmest period of the day and during the summer months. This problem can be further exacerbated in the vicinity of industrial discharge where warm water used to cool machinery is less able to hold oxygen than the basin to which it is released. The purple sulfur bacteria (PSB) are part of a group of Proteobacteria capable of photosynthesis, collectively referred to as purple bacteria. They are anaerobic or microaerophilic, and are often found in stratified water environments including hot springs, stagnant water bodies, as well as microbial mats in intertidal zones. Unlike plants, algae, and cyanobacteria, purple sulfur bacteria do not use water as their reducing agent, and therefore do not produce oxygen. Instead, they can use sulfur in the form of sulfide, or thiosulfate (as well, some species can use H2, Fe2+, or NO2−) as the electron donor in their photosynthetic pathways. The sulfur is oxidized to produce granules of elemental sulfur. This, in turn, may be oxidized to form sulfuric acid. In oceanic biogeochemistry, the f-ratio is the fraction of total primary production fuelled by nitrate. The ratio was originally defined by Richard Eppley and Bruce Peterson in one of the first papers estimating global oceanic production. This fraction was originally believed significant because it appeared to directly relate to the sinking (export) flux of organic marine snow from the surface ocean by the biological pump. However, this interpretation relied on the assumption of a strong depth-partitioning of a parallel process, nitrification, that more recent measurements has questioned. The Cariaco Basin lies off the north central coast of Venezuela and forms the Gulf of Cariaco. 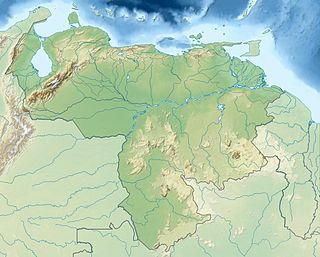 It is bounded on the east by Margarita Island, Cubagua Island, and the Araya Peninsula; on the north by Tortuga Island and the Tortuga Banks; on the west by Cape Codera and the rocks known as Farallón Centinela; and on the south by the coast of Venezuela. Secondary treatment is a treatment process for wastewater to achieve a certain degree of effluent quality by using a sewage treatment plant with physical phase separation to remove settleable solids and a biological process to remove dissolved and suspended organic compounds. After this kind of treatment, the wastewater may be called as secondary-treated wastewater. 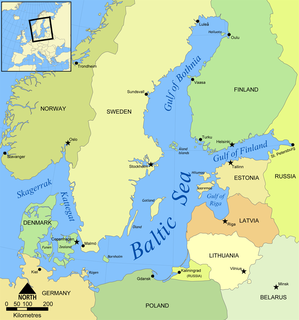 Baltic Sea hypoxia refers to low levels of oxygen in bottom waters, also known as hypoxia, occurring regularly in the Baltic Sea. As of 2009 the total area of bottom covered with hypoxic waters with oxygen concentrations less than 2 mg/l in the Baltic Sea has averaged 49,000 km2 over the last 40 years. The ultimate cause of hypoxia is excess nutrient loading from human activities causing algal blooms. The blooms sink to the bottom and use oxygen to decompose at a rate faster than it can be added back into the system through the physical processes of mixing. 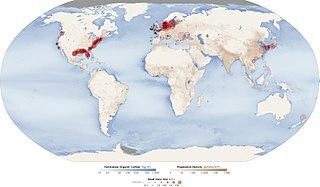 The lack of oxygen (anoxia) kills bottom-living organisms and creates dead zones. Isorenieratene is a carotenoid light harvesting pigment with the chemical formula C40H48. Isorenieratene and its derivatives are useful to marine chemists studying the carbon cycle as biomarkers that indicate photic zone anoxia. Chondrites is a trace fossil ichnogenus, preserved as small branching burrows of the same diameter that superficially resemble the roots of a plant. The origin of these structures is currently unknown. Chondrites is found in marine sediments from the Cambrian period of the Paleozoic onwards. It is especially common in sediments that were deposited in reduced-oxygen environments. Three Western Interior Seaway anoxic events occurred during the Cretaceous in the shallow inland seaway that divided North America in two island continents, Appalachia and Laramidia. During these anoxic events much of the water column was depleted in dissolved oxygen. While anoxic events impact the world's oceans, Western Interior Seaway anoxic events exhibit a unique paleoenvironment compared to other basins. The notable Cretaceous anoxic events in the Western Interior Seaway mark the boundaries at the Aptian-Albian, Cenomanian-Turonian, and Coniacian-Santonian stages, and are identified as Oceanic Anoxic Events I, II, and III respectively. The episodes of anoxia came about at times when very high sea levels coincided with the nearby Sevier orogeny that affected Laramidia to the west and Caribbean large igneous province to the south, which delivered nutrients and oxygen-adsorbing compounds into the water column. Euxinia or euxinic conditions occur when water is both anoxic and sulfidic. 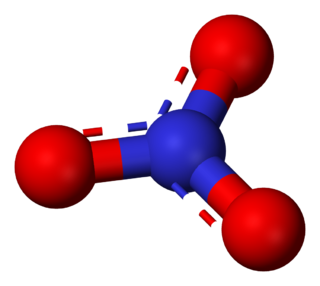 This means that there is no oxygen (O2) and a raised level of free hydrogen sulfide (H2S). Euxinic bodies of water are frequently strongly stratified, have an oxic, highly productive, thin surface layer, and have anoxic, sulfidic bottom water. The word euxinia is derived from the Greek name for the Black Sea- Εὔξεινος Πόντος (Euxeinos Pontos)- which translates to "hospitable sea". Euxinic deep water is a key component of the Canfield ocean, a model of oceans during the Proterozoic known as the Boring Billion proposed by Donald Canfield, an American geologist, in 1998. There is still debate within the scientific community on both the duration and frequency of euxinic conditions in the ancient oceans. Euxinia is relatively rare in modern bodies of water, but does still happen in places like the Black Sea and certain fjords. An oxygen minimum zone (OMZ) is characterized as an oxygen-deficient layer in the world oceans. Typically found between 200m to 1500m deep below regions of high productivity, such as the western coasts of continents. OMZs can be seasonal following the spring-summer upwelling season. Upwelling of nutrient-rich water leads to high productivity and labile organic matter, that is respired by heterotrophs as it sinks down the water column. High respiration rates deplete the oxygen in the water column to concentrations of 2mg/l or less forming the OMZ. Under these oxygen-starved conditions, energy is diverted from higher trophic levels to microbial communities that have evolved to use other biogeochemical species instead of oxygen, these species include Nitrate, Nitrite, Sulphate etc. 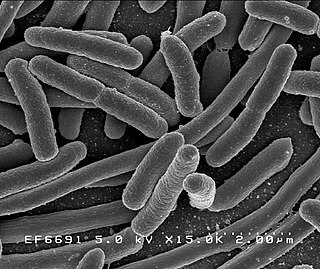 Several Bacteria and Archea have adapted to live in these environments by using these alternate chemical species and thrive. The most abundant phyla in OMZs are Proteobacteria, Bacteroidetes, Actinobacteria, and Planctomycetes. ↑ "Volatile Organic Compounds in the Nation's Ground Water and Drinking-Water Supply Wells: Supporting Information: Glossary". US Geological Survey. Retrieved 3 December 2013. ↑ Bjork, Mats; Short, Fred; McLeod, Elizabeth; Beer, Sven (2008). Managing Sea-grasses for Resilience to Climate Change. Volume 3 of IUCN Resilience Science Group Working Papers. Gland, Switzerland: International Union for Conservation of Nature (IUCN). p. 24. ISBN 978-2-8317-1089-1. ↑ "Streamflow and Nutrient Delivery to the Gulf of Mexico for October 2009 to May 2010 (Preliminary)" . Retrieved 2011-02-09. 1 2 3 Castro, Peter; Huber, Michael E. (2005). Marine Biology 5th ed. McGraw Hill. ISBN 978-0-07-250934-2. ↑ "5.2 Dissolved Oxygen and Biochemical Oxygen Demand". Water: Monitoring & Assessment. US Environmental Protection Agency. Retrieved 3 December 2013. ↑ Nudds, John; Selden, Paul (2008-07-01). "Fossil–Lagerstätten". Geology Today. 24 (4): 153–158. doi:10.1111/j.1365-2451.2008.00679.x. ISSN 1365-2451. ↑ Bush; et al. (2017). "Oxic-anoxic regime shifts mediated by feedbacks between biogeochemical processes and microbial community dynamics". Nature Communications. 8 (1): 789. Bibcode:2017NatCo...8..789B. doi:10.1038/s41467-017-00912-x. PMC 5630580 . PMID 28986518. ↑ "Dissolved Oxygen Depletion in Lake Erie". Great Lakes Monitoring. US Environmental Protection Agency. Retrieved 3 December 2013. Gerlach, S. (1994). "Oxygen conditions improve when the salinity in the Baltic Sea decreases". Marine Pollution Bulletin. 28 (7): 413–416. doi:10.1016/0025-326X(94)90126-0. Hallberg, R.O. (1974) "Paleoredox conditions in the Eastern Gotland Basin during the recent centuries". Merentutkimuslait. Julk./Havsforskningsinstitutets Skrift, 238: 3-16. Jerbo, A (1972). "Är Östersjöbottnens syreunderskott en modern företeelse?". Vatten. 28: 404–408. Richards, F.A. (1965) "Anoxic basins and fjords", in Riley, J.P., and Skirrow, G. (eds) Chemical Oceanography, London, Academic Press, 611-643. Sarmiento, J. L.; Herbert, T. D.; Toggweiler, J. R. (1988). "Causes of anoxia in the world ocean". Global Biogeochemical Cycles. 2 (2): 115. Bibcode:1988GBioC...2..115S. doi:10.1029/GB002i002p00115. Sarmiento, J.A. et al. (1988-B) "Ocean Carbon-Cycle Dynamics and Atmospheric pCO2". Philosophical Transactions of the Royal Society of London, Series A, Mathematical and Physical Sciences, Vol. 325, No. 1583, Tracers in the Ocean (May 25, 1988), pp. 3–21. Van Der Wielen, P. W. J. J.; Bolhuis, H.; Borin, S.; Daffonchio, D.; Corselli, C.; Giuliano, L.; d'Auria, G.; De Lange, G. J.; Huebner, A.; Varnavas, S. P.; Thomson, J.; Tamburini, C.; Marty, D.; McGenity, T. J.; Timmis, K. N.; Biodeep Scientific, P. (2005). "The Enigma of Prokaryotic Life in Deep Hypersaline Anoxic Basins". Science. 307 (5706): 121–123. Bibcode:2005Sci...307..121V. doi:10.1126/science.1103569. PMID 15637281. .